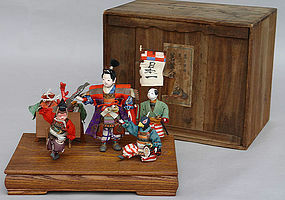 This set of dolls was made for Japanese Boy’s Day. It comes from one of Japanese folklores, Peach Boy, Momotaro. Momo is translated to peach and Taro (ta-ro-o) is a common name for boys. The writing on the label (on the box) is "Wakana Ningyo", the date of purchase is the 10th years of Taisho (1921), 92 years ago! The condition is excellent (old but new condition) - the set appears newer than it actually is in the photos. Momotaro's fan (made out of one piece of paper) is bent down (as shown) - a small piece of paper from the back will be helpful. There is a good article about Peach Boy in Wikipedea under Momotaro: A song for Peach Boy was made in 1911 for Japanese children. This is a copy of the translation from Wikipedea. Hitotsu watashi ni kudasai na? --Won't you give me one? This is how the brave boy, Momotaro gained the hearts of a talking dog, monkey and pheasant and won the battle with the ogres and ended up with their treasure. The dimensions of the stand: 10 1/12" x 6 1/4" x 1 3/4", Momotaro is 5 1/2" tall (to the tip of his hair).